Westfield Organ Company was founded in 1970 as the Allen Organ representative for Western Michigan. Since that time, our sales and service territory has expanded to include central and northern Michigan as well as the South Bend and Michigan City areas of Indiana. 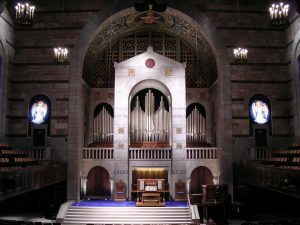 Over the past 40 years, we have installed more than 800 organs in varying houses of worship and we continue to service these instruments, many of which are still performing after 40 years of use! Westfield Organ Company is committed to delivering quality results. We hold the belief that honesty, clear communication, and complete transparency are essential ingredients to a successful business/client relationship. We look forward to meeting with you and learning more about how we can serve you, and your parish. Please contact us today at (800) 968-1199.